Dan Edelman tries his hand at coaching little league the CrossFit Kids way. 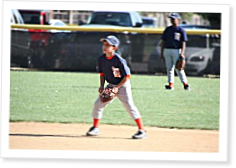 My son has been playing organized ball since he was 5—he’s 9 now. Five seasons. Most of that time, I’ve been a spectator. I’ve seen aimless practices painfully rote and void of any genuine preparation for actual game play. I’ve seen kids not make plays simply because they didn’t believe they could. I’ve seen coaches and dads humiliate their sons with no apparent awareness of their cruelty. And I’ve seen kids having all kinds of fun during the game, but not having fun playing the game. So even while I had no intention of ever taking a team, a coaching philosophy gradually began to coalesce. During the 2010 tournament season, I found myself engaging in running commentaries about the ball games with another dad I knew from a couple of seasons, and I learned he shared my perspective. We both wanted to help our boys develop their baseball so they could go as far as they wanted to go. The short of it was we decided to play “Daddy Ball”: we would take a team, protect our kids from certain self-deluded frauds and, if all went well, provide a good environment in which to sharpen our boys’ skills with an eye toward long-term development. What I needed was a teaching methodology with which to frame my fledgling philosophy, so I turned to CrossFit Kids. What Can Your Kid Do? Are You Sure? Dan Edelman visits the CrossFit Kids Gauntlet and finds the missing link between fitness and the zombie apocalypse. The Games’ first CrossFit Kids Teen Challenge exemplifies what the youth program is all about. Dan Edelman explains. For the first time, CrossFit Kids HQ provides guidance on a competition involving children. Dan Edelman tells the story. Dan Edelman explains how to keep children engaged well into adulthood with solid programming. Wow! That is about the only term I can use to describe Dan's contribution to the journal. I'm in a similar situation with the my three son's playing baseball and can attest to the accepted negative talk and the lack of development that exists in these leagues. I've even use the saying that, "The most important thing is to have fun". One will never here those words come out of my mouth again. Instead...it will be, "The most important thing is to have fun playing baseball". Chances are so slim that a kid can do anything beyond high school ball, yet we still lose focus on doing the one thing that will be the most important to the well being of our kids....developing them for the challenges they will face in life and equipping them with the tools to do that via the sports they learn. I hear ya Dan! Thanks for such a well put together article about what's important and how Crossfit has benefitted you in the meantime. Now I'm off to find the closest Crossfit Kids in my area! Nicely put Dan...I want a signed copy! Thank you for all the time and research that went into this article. Great article.